Organic roasted tofu. Braised black beans. Such menu items would not surprise diners at a health food restaurant. But in the school lunch line? They are just some of the food offerings at an elementary school in Flushing, N.Y., which recently reported multiple benefits after switching its cafeteria fare to an all-vegetarian menu in January. Although childhood-obesity rates appear to be leveling off, it's still a major health issue. 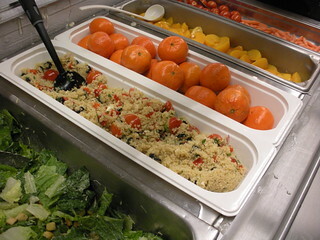 Various efforts like the Meatless Monday Campaign, and federal school food rules exist to help curb obesity, but at P.S. 244, officials are seeing benefits of going all-vegetarian beyond those associated with students' physical health. Student attendance, test scores, and energy levels have reportedly improved at this Queens elementary school, according to the New York Daily News. The school was recognized by the Washington-based Physicians Committee for Responsible Medicine, an advocacy group that promotes plant-based diets, for becoming the first public school to change its cafeteria menu to all-vegetarian fare. Bob Groff, the principal of P.S. 244 told the Daily News, that the school switched its food choices because the plant-based choices "were better than the carnivorous ones offered by the city." After a single semester, Groff said the number of students classified as overweight and obese dropped 2 percent, and the students have longer attention spans and better academic scores. Despite these reported gains in student health and academics though, there's concern that some of the more picky eaters may not be getting enough nutrients. Over on the Parents.com blog, Eliza Zied, a registered dietitian and nutritionist, applauds efforts that push for more plant-based diets, but doesn't find the approach necessary to eighty-six the meat, poultry, and fish from every school lunch menu everyday.